Transport bosses have been accused of holding up the opening of the long-awaited bypass – by not completing the proper legal paperwork. A north-east politician has claimed that senior sources within the AWPR project have revealed unresolved red tape has delayed the opening. But last night, Transport Scotland dismissed the claims as “absolute nonsense” and said the road would be opened as soon as possible. There has been widespread criticism of roads bosses for not “coming clean” on why the project has been delayed. The 28-mile route has yet to be fully opened despite multiple stretches appearing to be in perfect condition. Now MP Andrew Bowie has claimed several sources – including a senior member of the project team – have told him that Transport Scotland has failed to get the opening legal approval, leaving motorists in limbo. The West Aberdeenshire and Kincardine representative said: “People across the north-east have waited decades for this road and have put up with years of disruption during construction. “As the project inches towards completion, it seems odd that Transport Scotland and the SNP government are so reluctant to set a date for opening. “I have been informed now by several sources that the root of the problem is that legal paperwork has not been completed by Transport Scotland to allow competed sections to open. “In fact, I have been told that the route – bar the River Don bridge – has been ready for several weeks now. Last week politicians and business leaders joined together in the P&J and called for the government to stop “dragging its heels” and get the route open. 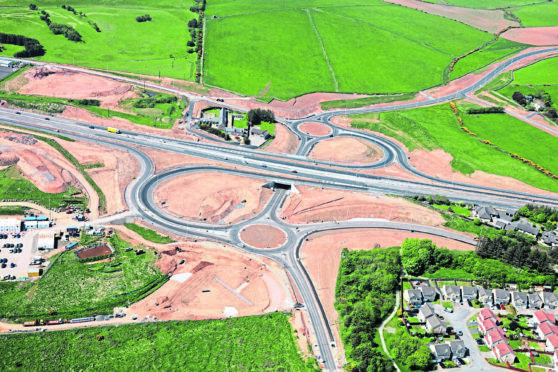 The road has been repeatedly beset with delays, with the Balmedie-Tipperty stretch finally opening in August – well beyond the spring 2017 estimate. The first stretch of the £745million project opened in June, between Parkhill, near Dyce, and Blackdog. Construction teams are still working on the River Don bridge after it became apparent there were cracks in the structure. Derek Mitchell, managing director of haulage firm Caledonian Logistics, said the company was losing money every day the road remained closed. He said yesterday: “This is why we relocated to Kintore four and a half years ago – we are only about a mile, mile and a half from the bypass. “We have got drivers that are having to stop and take their 45 minute breaks because of the time they have been in the lorries, we have then got another 10-15 drivers waiting at the depot for these deliveries. When you add all that time and money that’s being wasted it’s a lot. A spokesman for Transport Scotland said: “This is absolute nonsense. Transport Scotland is doing everything possible to ensure the new road opens at the earliest opportunity. “We have investigated the potential to open the 31.5km (19 mile) section of new road from Craibstone to Stonehaven and Charleston as soon as possible, while remedial work at the Don progresses. The first stretch of the bypass, north of the city, was due to be open in spring last year. However Transport Scotland revealed in December 2016 that vital groundwork had not been completed prior to the drop in temperature. Then in January of this year construction giant, Carillion – a key partner in ARL – collapsed. Despite claiming that the project would be unaffected, the then transport minister Keith Brown later admitted the scheme would not be completed until the autumn. Mr Brown blamed cold weather, 2016’s Storm Frank and the Carillion collapse on the delays. In July, major defects were uncovered on the Don Bridge and contractors Balfour Beatty later confirmed these repairs would cost in the millions. Since then there has been mounting frustration in the north-east, with no firm dates set for the full opening of the massive project. In the wake of a festival event that saw a stretch temporarily opened to cyclists, First Minister Nicola Sturgeon herself made an embarrassing gaffe suggesting the entire route would be open “by the end of the year”. Transport chiefs were forced to quickly deny that any part of the bypass was due to open that weekend, or that the timetable for completion had slipped from the official “late autumn” target.